32 GB (23.8 GB available to user) of internal storage. Manage and customize your kids' experience with up to four individual child profiles. Titles are age-appropriate for kids from 3-12. 8th generation - 2018 release. 2017 Release. Amazon Fire HD 10 - 10.1" - Tablet - 32GB 7th Generation. Year of Release: 2017. 32GB internal storage plus microSD slot. The all-new Fire HD 10 features our largest display, now in 1080p Full HD, 32 GB storage, 2 GB RAM, and up to 10 hours of battery. Condition is Used. No charging cord included. Trending at $21.48eBay determines this price through a machine learned model of the product's sale prices within the last 90 days. Condition is Manufacturer refurbished. your caption fast. Up for sale is one Amazon Fire HD 8 (7th Generation) 32GB, Wi-Fi, 8In - Black. Item is a factory refurbished unit in perfect conditions. 16GB internal storage plus microSD slot. Android OS customized for Amazon. 1 Amazon Fire HD 8 - 8" - Tablet - 16GB. Type Tablet. Crisp, bright resolution for watching movies, surfing the web, reading books and more. Amazon Kindle E-reader 6" Display, Wi-Fi and Built-In Audible. --------Box includes the kindle e-reader, the USB cable and a small manual. This is 8th Generation (NOT the newest version). This is Black color. This kindle paperwhite is USED. It will contain blemishes including but not limited to: light to moderate scratches on the screen and/or housing. It may have sticker residue on the back housing. The paperwhite has been tested and cleared. ￼ BUY IT NOW! ￼ ￼ Amazon Kindle Paperwhite (5th Generation) 2GB, Wi-Fi, 6in - Black in good condition will have minor scratches. Each kindle has been tested. the light reflection in the picture is not damage. Comes with a charger. Great buy. Don't be fooled by other sellers our kindles are not black listed. Nor do they have ink blots or white spots. ￼ ￼ ￼ Free Shipping 100% Original Quick Delivery used in good condition. Rating 8. (Model Number:Fire 8 HD (7th Gen) SX034QT. - Kindle 8" Tablet (Ad-Free Version). Good condition, may have scratches/scuffs and light cracks on the housing!). Compatibility: Will work on WiFi universally. Condition rating 8-10. Comes with charger. Great gift. Has minor scratches and signs of use. Instantly connect to enabled Echo devices. We will try our best to make it as easy as possible. Trending at $55.99eBay determines this price through a machine learned model of the product's sale prices within the last 90 days. Trending at $162.99eBay determines this price through a machine learned model of the product's sale prices within the last 90 days. Network: Not Applicable Product Line: kindle paperwhite. Model Amazon Kindle Paperwhite (10th Generation). • The thinnest, lightest Kindle Paperwhite yet—with a flush-front design and 300 ppi glare-free display that reads like real paper even in bright sunlight. All-New Amazon Fire 7 Tablet with Alexa 7" Display 8GB LATEST 7th Generation - Black. Amazon Fire 7Tablet (7th Generation) - Latest Model. More durable than the latest iPad. Amazon 5W Power Adapter. Amazon Kindle Paperwhite 3rd (7th Generation) 4GB, Black, High Resolution 300PPI. 16 GB (9.8 GB available to user) or 32 GB (23.8 GB available to user) of internal storage. Quad-Core: 1.3 GHz with 1.5 GB of RAM. VoiceView screen reader enables access to the vast majority of Fire tablet features for users who are blind or visually impaired using text-to-speech or a connected refreshable braille display. Exclusive 8.9" HDX display with over 4 million pixels (339 ppi / 2560 x 1600). Our most powerful tablet ever. With our dynamic pricing model, our prices are always competitive. You're already purchasing the item. Combine play with learning on this Amazon Fire 7 Kids Edition tablet, featuring a tough pink case that withstands even active tots. 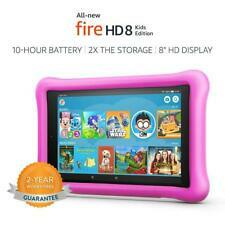 This Amazon Fire 7 Kids Edition has antiglare screen for easy viewing. (Kindle 7" Tablet (Ad-Free Version). Model Number:Fire 7" (7th Gen). Compatibility: Will work on WiFi universally. Good condition, may have scratches/scuffs!). What's included. Amazon Kindle Oasis 2, 32GB, Wi-Fi - Graphite. The screen will have small, light scratches. The back housing and contour will have very few flaws with may include scratches, scuffs, and dings. There will be no charging case or any other accessories. Amazon Kindle Voyage 6" Wi-Fi, 7th Generation - Black. This is a USED item but it has been tested and cleared. There may also be sticker residue on the back. The item that you receive may show different signs of wear, but will not exceed the conditions shown in the photos. 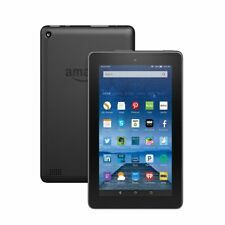 Amazon FireHD 10 Tablet Black. Instantly connect to enabled Echo devices. 32 or 64 GB internal storage expandable by up to 256 GB (using the microSD slot). Brilliant 10.1" 1080p Full HD display (1920 x 1200), up to 1.8 GHZ quad-core processor, 2 GB RAM, and up to 10 hours of battery life. Content can still be loaded onto the device via a standard USB transfer from your PC or Mac. Includes: Kindle only. item has wear and tear around device. Hardware fully functional. front display has 3 or 4 small dots on it that you can see when backlight is on. Amazon Kindle Fire HD 10 Tablet Full 1080p Display 32GB Black 7th Gen 2017. Up to 10 hours of reading, surfing the web, watching video, and listening to music. Battery life will vary based on device settings, usage, and other factors such as web browsing and downloading content. Amazon Kindle Fire HD 10 Tablet Full 1080p Display 32GB Punch Red 7th Gen 2017. Up to 10 hours of reading, surfing the web, watching video, and listening to music. Battery life will vary based on device settings, usage, and other factors such as web browsing and downloading content. Amazon Kindle Basic (7th Generation) 4GB, Wi-Fi, 6in, Black. Screen in excellent condition, no dead pixels. ��Amazon Fire HD 10 (7th Generation) 32GB, Wi-Fi, 10.1 inch - Black - BRAND NEW! ��Amazon Fire HD 10 (7th Generation) 32GB, Wi-Fi, 10.1 inch - Marine Blue! NEW! Amazon offers a variety of tablets and eBook readers that provide users with many functions and features. Amazon's line of Kindle devices are built for reading, giving users a lightweight, long-lasting alternative to traditional books. Amazon's Fire tablets, on the other hand, are all-purpose entertainment devices, and usually include Wi-Fi connectivity. What types of Amazon Kindle e-readers are available? Amazon Kindle: The classic Amazon Kindle has a touchscreen display and a battery life that lasts for weeks without a charge when on standby. Kindle Paperwhite: The Kindle Paperwhite is designed to mimic the look and feel of reading an actual book. With the Paperwhite e-reader, there is never any glare, even in direct sunlight. To make reading more comfortable, it also has a built-in adjustable light. Kindle Voyage: The Voyage has a number of additional features, including PagePress. This allows readers to turn the pages of their eBook without swiping the screen. It also has an adaptive front light, which gives readers absolute control over their screen brightness. Kindle Oasis: The Oasis has a large 7-inch display, making it a large member of the Amazon Kindle family. It also comes with the Audible audiobook app and it is waterproof. Kindle for Kids: The kid version of the classic device is kid-friendly and comes with child safety features, like Parental Controls. What are the benefits of Amazon Kindle e-readers? With Paperwhites and other Amazon e-readers, readers can charge their device monthly rather than daily. The Kindle Paperwhite, Kindle Voyage, and Kindle Oasis are also lightweight. In fact, they weigh less than the average paperback book. The Kindle Paperwhite resembles a paperback in more ways than one. Thanks to hand-built fonts and real ink particles, the onscreen text is very similar to that of a physical book. The Paperwhite, Voyage, and Oasis are designed exclusively for reading. This means that users can read without the distractions of texts, email alerts, and social media. Even so, the Paperwhite and other Amazon e-readers give users easy access to the Kindle Store. It has millions of eBooks available, including classical works. The original Kindle has Wi-Fi capabilities. The Paperwhite, Voyage, and Oasis have cellular connectivity in addition to Wi-Fi. What types of Fire tablets are available? Fire 7: With its 7-inch screen and 8 hours of battery life, the original Fire is an all-purpose tablet. Fire HD 8: The Fire HD 8 has an 8-inch HD screen, and it comes dual stereo speakers. This Kindle's battery lasts for up to 12 hours. Fire HD 10: The 10-inch version of the Fire is great for watching videos and playing games, thanks to its increased resolution. Content provided for informational purposes only. eBay is not affiliated with or endorsed by Amazon.